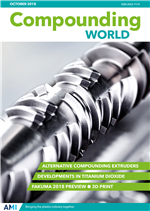 The October 2018 edition of Compounding World is now available for viewing. Just click here to see the magazine in full, completely free of charge. Industry news including Lanxess adding compounding capacity; Westlake Chemical buying Nakan; Univar acquiring Nexeo; Italian machinery trade balance weakens.